Fungus Fighter Plus contains the active ingredients trifloxystrobin and tebuconazole and so protects, controls and eradicates a broad spectrum of diseases. The combination of these actives gives a contact and systemic action, so it is fast-acting and gives long lasting protection of up to three weeks. 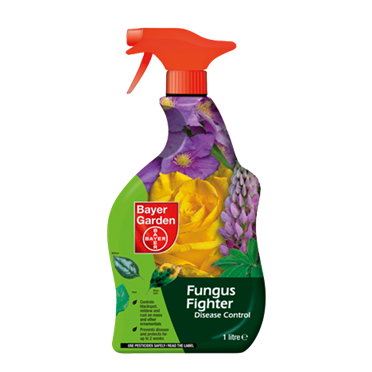 Fungus Fighter Concentrate contains the active ingredient tebuconazole and controls the major leaf diseases of roses and ornamental plants such as asters, hollyhocks, snapdragons and box. It controls blackspot and leafspots, mildew and rust on roses, and box blight. Fungus Fighter and Systhane Fungus Fighter are both being withdrawn from store shelves in the autumn of 2015.